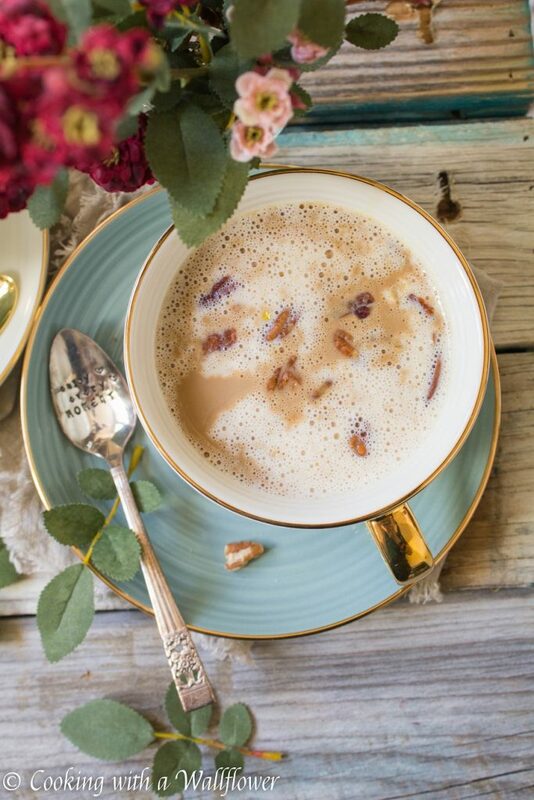 Coffee latte with oatmeal, maple, and pecan in every single bite. This Maple Pecan Oatmeal Latte is so delicious and perfect for breakfast on a chilly fall morning. 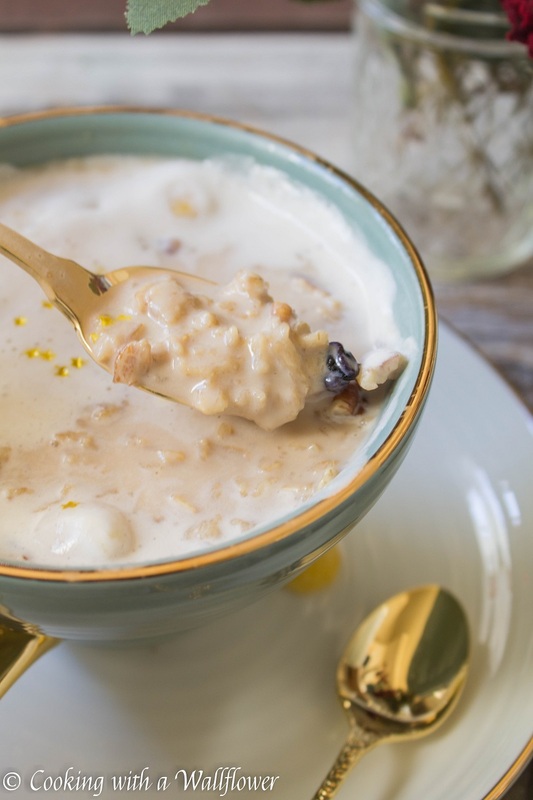 What better way to start your fall morning than with coffee and oatmeal sweetened with maple? It’s been so cold in the morning. It feels like the sun is rising later and later. And I really need something warm to keep me from freezing as I head to work early in the morning. Do you feel that way too? Or is it still warm where you are? 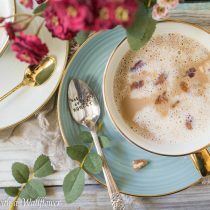 I recently discovered oatmeal lattes and now, I just can’t get enough of them! 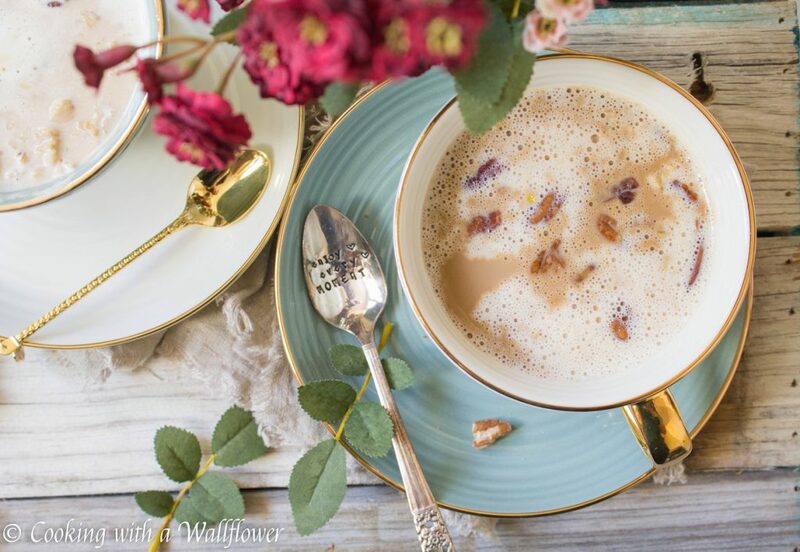 Have you ever had oatmeal lattes before? If you haven’t, you really need to try them. And this maple pecan oatmeal latte is the perfect place to start. What I love about oatmeal lattes is that you get the best of both worlds in a single cup. You can have your coffee to wake you up. And a little bit of oatmeal to keep you going through your day. I like mine with less coffee than in this recipe. Mostly because I’m sensitive to caffeine. Too much and I get a headache. But I love the taste of coffee so I always make mine with a lot more milk. 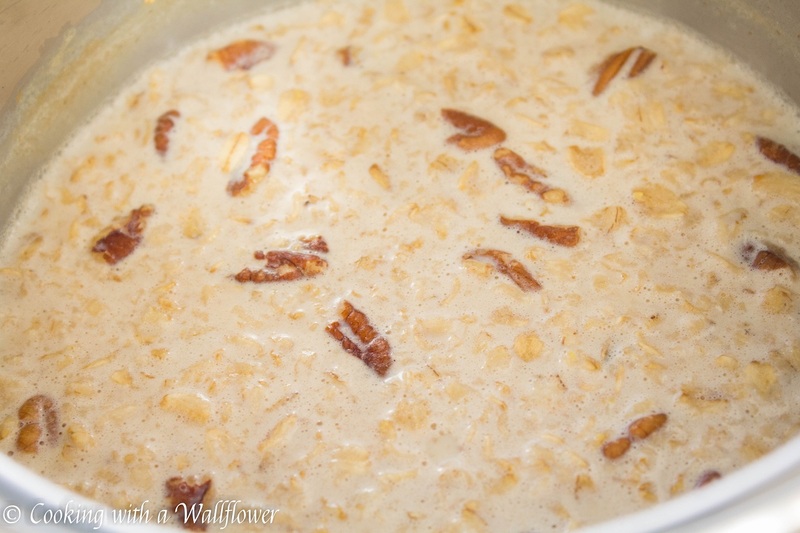 In a small pot, add whole milk, maple syrup, old fashioned oats, vanilla extract, and chopped pecans. Bring the milk mixture to a simmer. 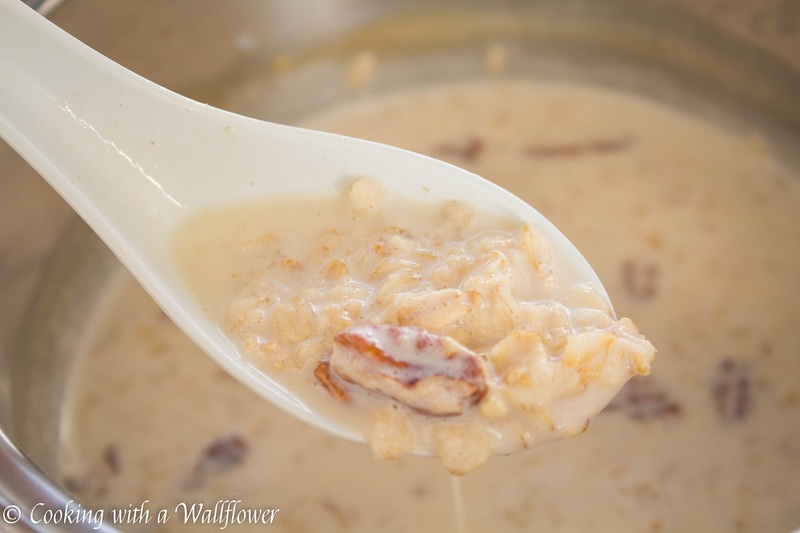 When the oatmeal mixture is steaming, remove the pot from heat. Use a fork or a small whisk to stir until the milk becomes foamy. I might have cheated and use a milk frother. It’s so much fun to use! Um, that is if I didn’t make a huge mess that I had to clean up afterwards. Divide the oatmeal mixture into two cups and pour the coffee over each. 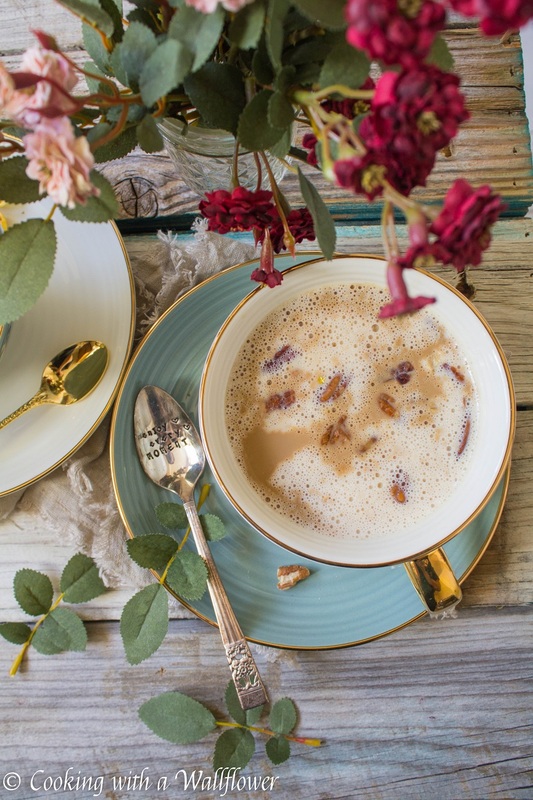 If you like, you can top each of the oatmeal lattes with whipped cream and granola. Sometimes I like them topped with granola and other days I like them without any of the toppings. It’s really up to you how you want to customize your latte. In a small pot, add whole milk, maple syrup, old fashioned oats, vanilla extract, and chopped pecans. Bring the milk mixture to a simmer. When the oatmeal mixture is steaming, remove the pot from heat. Use a fork or a small whisk to stir until the milk becomes foamy. 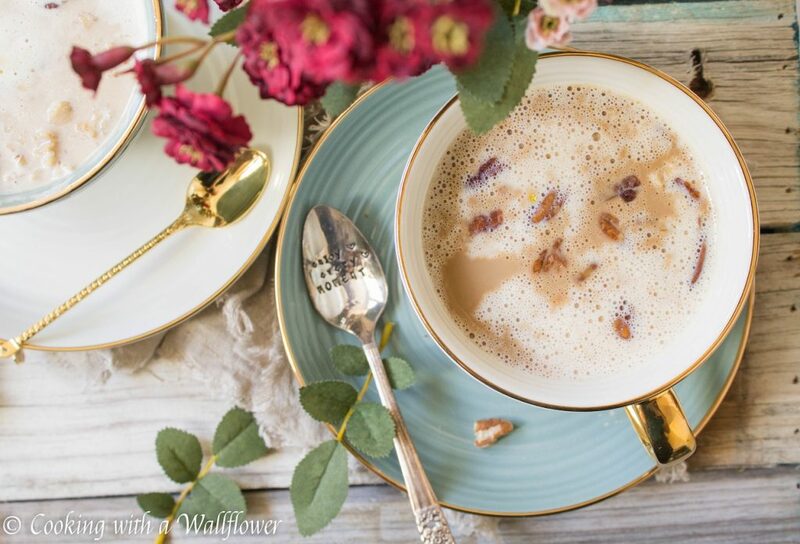 Serve the maple pecan oatmeal latte warm. Recipe inspired by Half Baked Harvest. 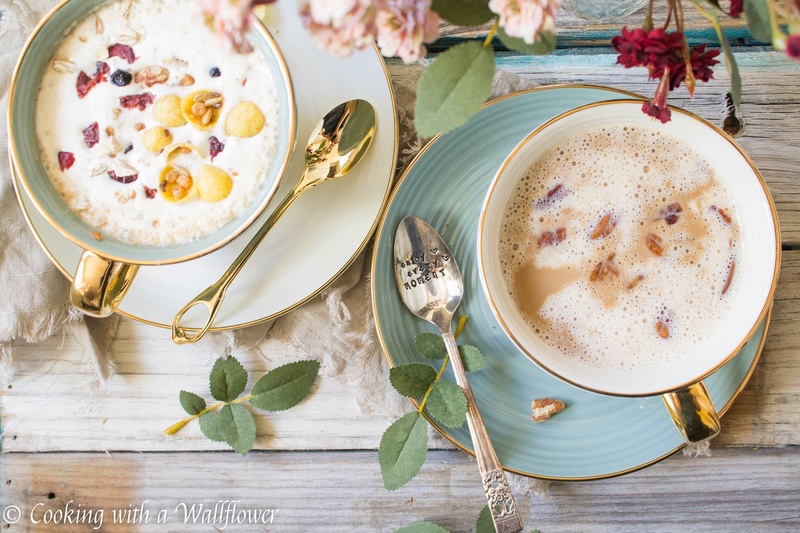 This entry was posted in Beverages, Breakfast, Fall Cravings, Quick and Easy, Recipes, Vegetarian and tagged breakfast, fall recipes, latte, oatmeal latte, quick and easy, vegetarian. Fantastic. 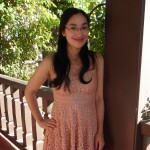 This blog is too good. Must be illegal.